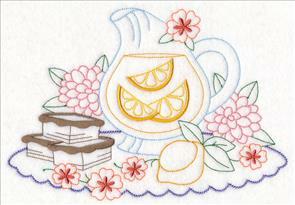 Give every room in your home a "lovely" update with these new embroidery designs. 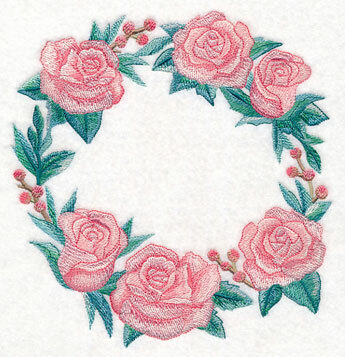 From soft roses to Valentine's Day doodles, the sweet motifs will help you celebrate the most romantic holiday of the year! 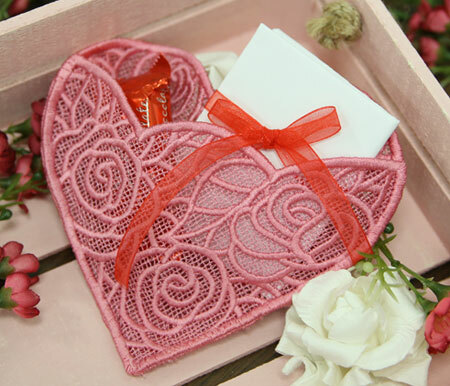 A lace heart pocket is the perfect place to slip cards and candies. 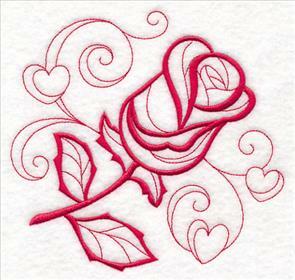 Or, embroider a 3D lace house to decorate your living room. Snuggling animal pairs are too-cute on kids' gear and blankets. Plus, a house pincushion and vintage-style kitchen scenes will add love to your home. 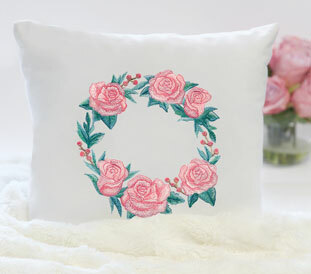 Strike love into the hearts of your family with beautiful watercolor roses on a pillow. 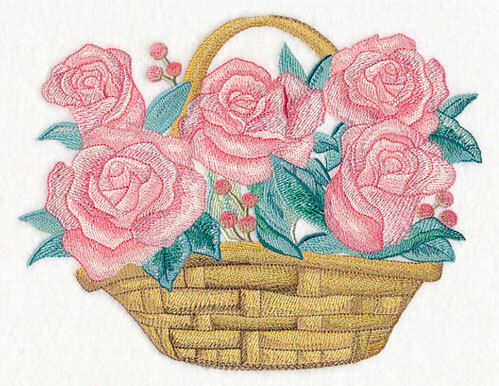 Bring romance to your embroidery with soft, pastel pink roses. The watercolor effect used in these designs adds an extra level of delicateness and decadence to any decorating scheme. 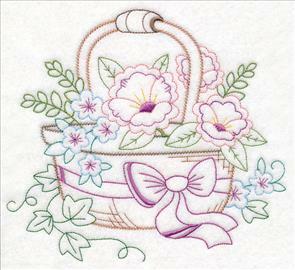 8.97" x 6.90" and 7.61" x 5.85" and 6.85" x 5.27" and 6.31" x 4.85"
Treat your true love with one of these brilliant blooms on a pillow or tote, or stitch them all together to create a lovely quilt or linens set. 7.45" x 7.78" and 6.68" x 7.01"
4.72" x 11.74" and 3.78" x 9.40"
3.13" x 7.80" and 2.75" x 6.85"
The combination of light, rosy pink and vibrant greens bring out the natural beauty found in a bouquet of roses. 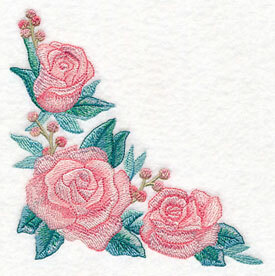 11.73" x 2.91" and 9.38" x 2.33" and 7.78" x 1.92" and 6.00" x 1.73"
Use these rose designs to decorate your home or for a special occasion. Great for weddings, anniversaries, and bridal showers, too! 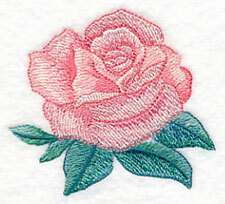 Stitch this garden of watercolor roses on linens, pillows, and other home decor. Get them all in a design pack! 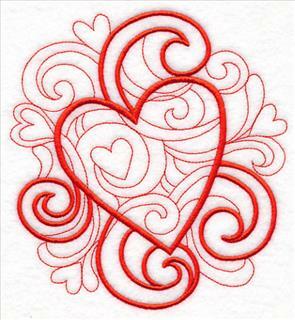 Whip up a quick gift this Valentine's Day with doodles that share your love with friends and family. 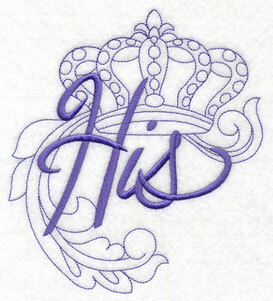 The one-color designs are delightful on pillows, totes, and more! 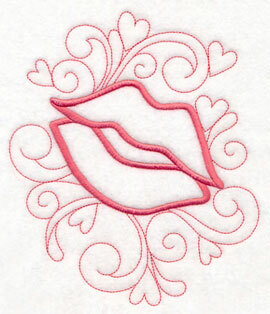 6.14" x 5.86" and 5.09" x 4.85"
6.32" x 5.85" and 5.24" x 4.85"
3.85" x 3.56" and 3.00" x 2.77"
Classic Valentine's Day motifs -- including a rose, heart, "Be Mine," "XOXO," and more -- will spread the spirit of the holiday in your embroidery. 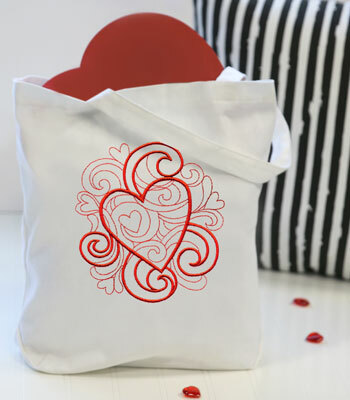 5.84" x 6.30" and 4.84" x 5.22"
Show off your Valentine's Day style wherever you go with a tote bag embellished with one (or more!) or these doodles. Use to carry gifts, chocolates, and other special treats to give on February 14. 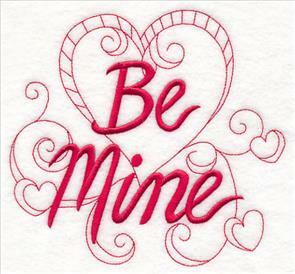 Decorate a T-shirt to wear on Valentine's Day with these doodles. Heart accents and a soft color palette are perfect for the romantic holiday. 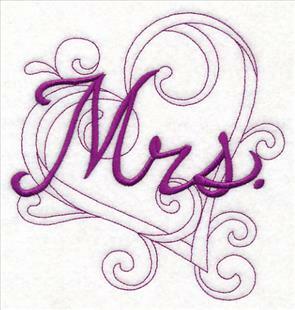 3.28" x 3.84" and 2.56" x 2.99"
Or, embroider these designs for weddings, anniversaries, and shower gifts, too! 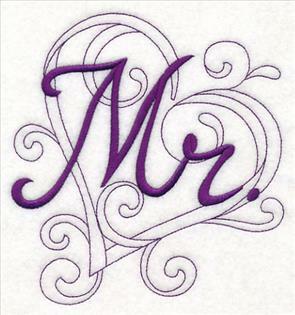 A pair of pillows spelling "Mrs." and "Mr." are a wonderful gift idea. 5.86" x 6.08" and 4.86" x 5.05"
5.71" x 6.06" and 4.74" x 5.02"
3.61" x 3.83" and 2.82" x 2.98"
His and hers designs are always popular on bath decor. 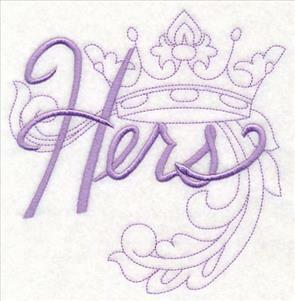 Embroider this set on a pair of cotton robes, or even on a set of sweatshirts. 5.83" x 5.97" and 4.83" x 4.95"
3.43" x 3.51" and 2.67" x 2.74"
Too-cute animal pairs cuddle up in these bright and colorful designs. 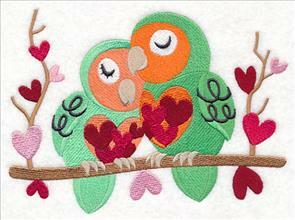 A mustachioed turtle and his lady are decked in hearts in this design. 7.80" x 3.22" and 6.84" x 2.83" and 3.89" x 1.61"
A pair of brilliant lovebirds and a couple of adorable mice celebrate their love. 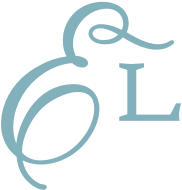 Great for kids' gear, home decor, and more. 7.81" x 3.48" and 6.88" x 3.06" and 3.89" x 1.73"
Did you know that sea otters hold hands while sleeping so they won't float away from each other at night? 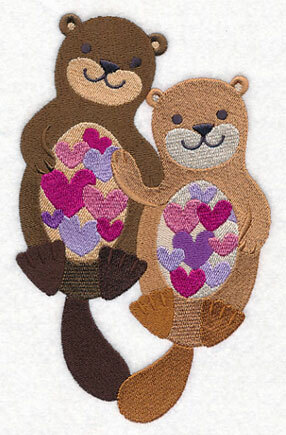 Add this cute-as-a-button pair to your next project! 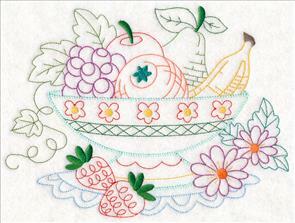 4.89" x 7.80" and 4.31" x 6.88" and 2.44" x 3.89"
Light, vintage-style kitchen scenes are full of life in these designs. 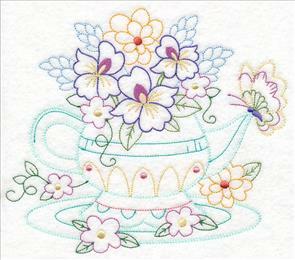 Each features blooming bouquets of flowers sprouting around baskets, tea pots, and more. 7.72" x 6.89" and 6.95" x 6.20"
7.90" x 6.82" and 7.18" x 6.20"
6.38" x 5.50" and 5.63" x 4.85"
A bowl of fruit and a tray of lemonade finish off this collection of tasty designs. 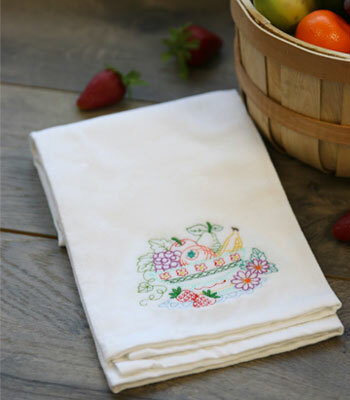 Terrific for placemats, wall art, and floursack towels, too! 9.12" x 6.85" and 7.79" x 5.85"
7.06" x 5.30" and 6.46" x 4.85"
9.40" x 6.51" and 8.46" x 5.86"
7.80" x 5.39" and 6.86" x 4.74"
Vintage-style designs are known for their light stitches, which can easily get lost in textured fabric. 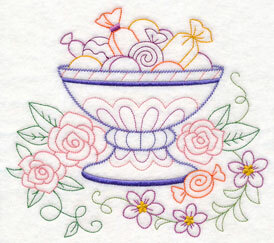 For best results, embroider on low-nap materials such as tea towels, twill, cotton, denim, or canvas. Pour a mug of rich coffee or treat yourself with a bite of candy. These designs depict classic still life scenes from your kitchen! 8.35" x 6.90" and 7.52" x 6.22"
6.71" x 5.55" and 5.93" x 4.90"
7.80" x 6.81" and 7.01" x 6.12"
6.31" x 5.51" and 5.56" x 4.86"
Give your kitchen a lovely update with these vintage-style scenes. Get them all now in a design pack -- regularly priced for $9.97! Create your home sweet home out of stunning freestanding lace with this 3D design. Lace panels make up the sides and roof of the house -- perfect for placing over a battery-operated tea light and displaying in your living room! 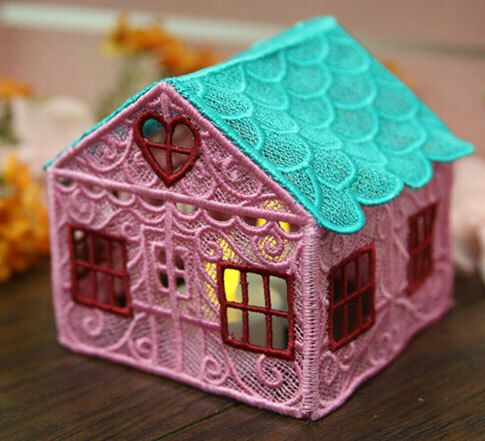 Find out how to make this gorgeous lace house here. 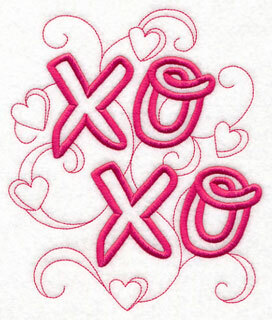 3.87" x 3.87" and 2.53" x 2.53"
Slip sweet candies or love notes in this lace heart pocket for Valentine's Day! It's also a wonderful way to give favors at weddings, bridal showers, and more. 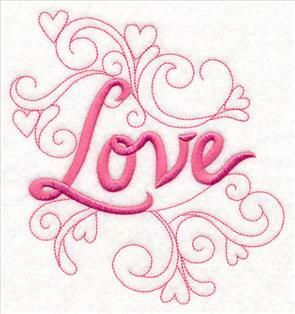 See how to stitch and assemble this lace heart pocket here. 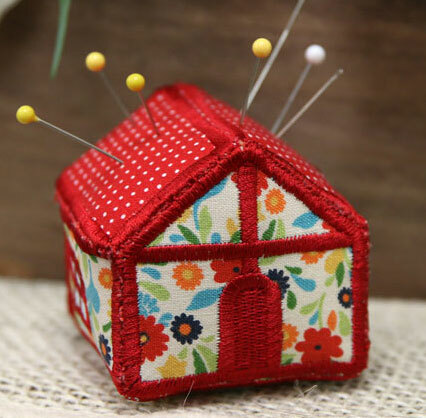 5.43" x 4.88" and 3.89" x 3.50"
Pins and needles have found a new "home" with this adorable in-the-hoop pincushion. Keep in your crafty or sewing room for easy access. 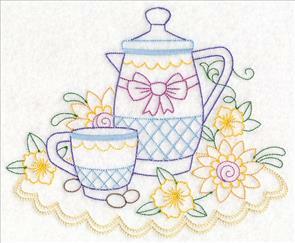 Get the free tutorial for this pincushion design here. 6.57" x 4.82" and 3.57" x 4.87" and 3.89" x 2.87"
Evelyn is such a sweetheart, and requested a pair of snuggling cats to embroider for her bedroom. 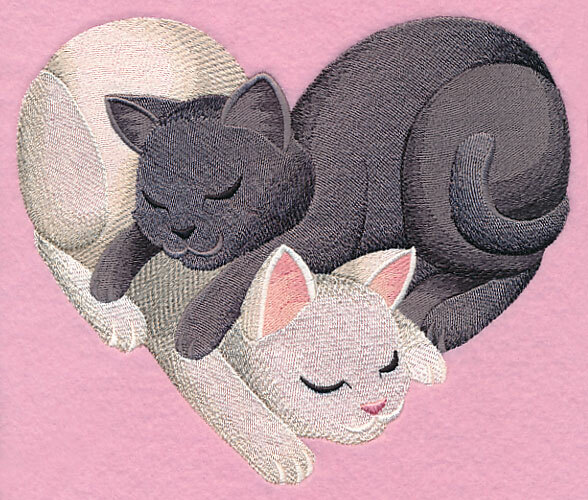 The pair of felines create the shape of a heart -- stitch on pillows, quilts, and more. 7.80" x 6.54" and 6.95" x 5.84" and 5.76" x 4.84" and 3.85" x 3.24"